Knitting keeps me warm. Occupied. Feeling productive. I’ve been keeping busy knitting a scarf. 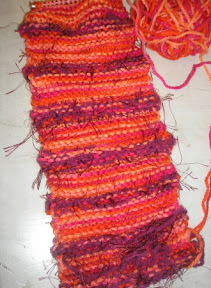 Well, actually I have about 8 scarves started, but got sick of them, abandoned and started this one. Wanted something a bit funky and different from my regular Fun Fur festivals, and needed to use up some yarn. Here she is about 1/4 of the way done. The feeling of a small troll, crammed between the roof of my mouth and my nose brought me to the doctor this afternoon. I guess I’ve got some sinus stuff going on. He recommended Afrin twice a day for a few days to open up those passages and let the goo drain. Attractive, I know!! I’ve been feeling intermittent goo slide down the back of my throat, and my tummy is a bit unsettled, so this wasn’t a big newsflash. I’ll admit, if I’m in my car or outside or somewhere where I’m not ashamed to show my lady-ness, I hack it up and hock it in a snowpile (or Kleenex and dispose, yes I do). I can spit pretty well, totally not proud of it– not putting it on the resume or anything. It’s just a fact. Cradle snot in a curled tongue and whuuck like a blowdart. I don’t like that crap going in my tummy. Save those calories for the good stuff, ya hurd? I do know to be careful with that spray because, a few years back, I lost my sense of smell from the stuff for a while. It was my own fault because I got a bit overzealous with the nasal spray, using it even when my nose was clear. Foolish. Christy’s got a contest going on. She’s giving away an Angie Stone CD. Go check it out. I actually received two discs from Angie’s publicist so I can give out both if I get enouh excited people. But so far not many seem thrilled. Try the Netipot it has worked wonders for my sinus issues. The only weird thing is I now have an eye infection – wondering if that happened because of the sinus flushing? Hope you feel better soon! I’ve held off my usual colds this year for some reason.. not that I’m complaining! Usually I’m stuffed up for most of the winter. It’s nice for a change to be able to breathe! Yes on the Neti pot (see next post ;)). Terri — that scarf is kick booty. I can’t seem to download the pattern, though. Keeps timing out.